When it comes to market breadth, the Advance-Decline line is definitely one of our go-to’s. This indicator calculates the net advancers. In other words, the number of advancing stocks less the number of declining stocks. This cumulative measure goes up and down over time, similar to the market indexes themselves. 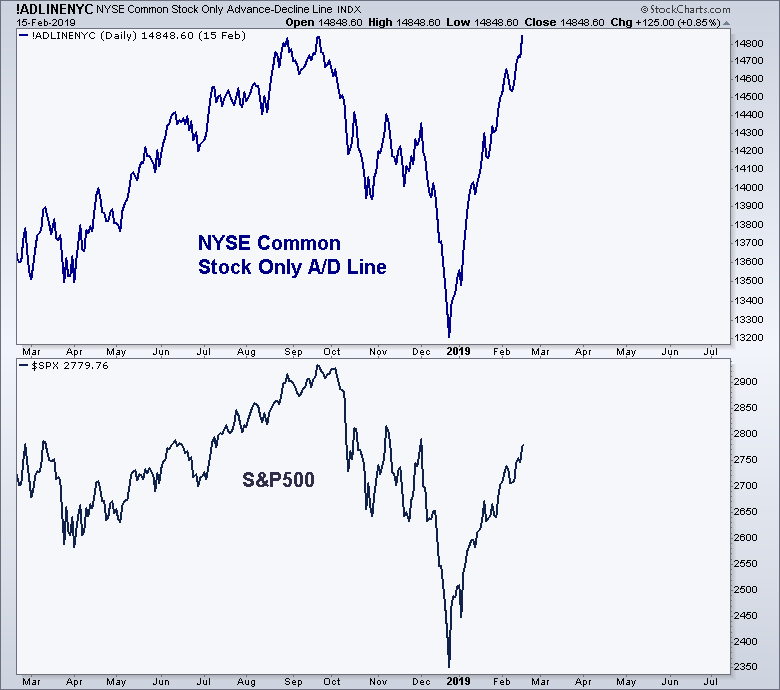 Something to keep in mind is the fact that we use the Common Stocks Only A-D Line because there are other vehicles that trade on the NYSE, like closed-end funds for example. If we’re analyzing the stock market, let’s stick to just stocks in our indicators. Here are the new all-time highs for the Advance-Decline line, which is not evidence of any kind of downtrend. This expansion of upside breadth continues to point towards higher stock prices from any sort of intermediate-term perspective. If you’re looking to short U.S. Stocks, this isn’t a reason to do it. We’ve been approaching the market from the long side throughout all of 2019. We’ve been focused on looking for risk vs reward scenarios skewed in our favor. I still think that is the best approach for the current market.